Engagement or just a couple photo shoot is one of the most popular in Venice. 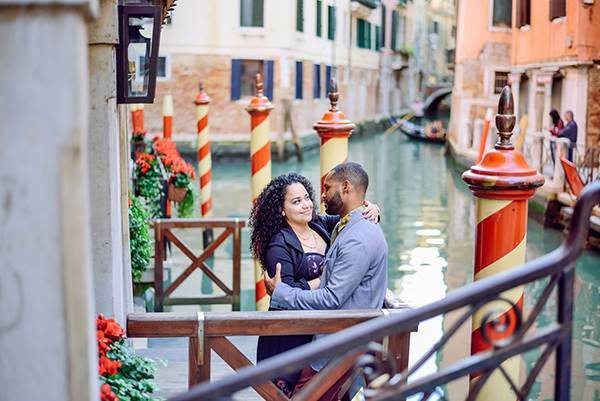 A lot of couples dream about professional pictures with venetian backgrounds. The city offers a variety of stunning places with gorgeous Italian architecture, romantic corners with bridges, water channels and flowers, pierces with gondolas and narrow streets. 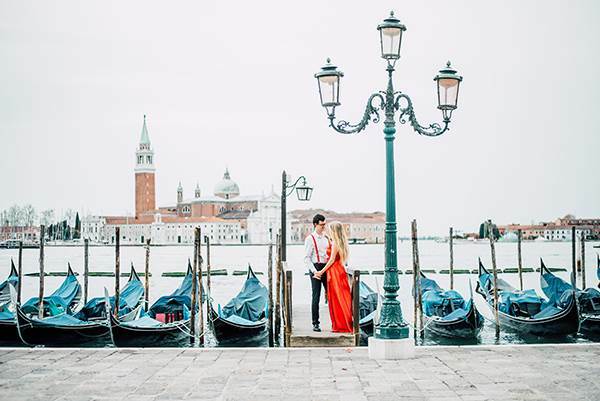 Engagement Venice photographer will create an amazing story of you two on these magic locations. Save your memories for all your live. The shooting will be fun and very relaxing. It will be a great experience that you will never forget. Contact us to inquire about availability and pricing. What is an engagement shooting? It is a couple shooting with your engagement Venice photographer. The pictures could be fun or romantic. If you going to visit the city with your sweetheart, book a professional photographer . Some couples book an engagement session to announce to families and friends that they will get married soon, others want to have nice pictures that they can use for the slideshow during the wedding . It is also a great opportunity to make images for your Save the Date cards. They will be unique and really precious. Let me tell your love story in Venice through the pictures. After booking your engagement Venice photographer, we will discuss your preferences for the meeting time and locations that you would like to cover. If you have your wish list of the places that you love, please send me them in advance, and we will plan our route. My goal is create a beautiful story of you two in the city. We will be walking around Venice, having fun and following the light. The style will be mixed of posed and candid images. Visit the page with frequently asked questions to know more about the photo services. When is the best time for a engagement shoot? Some couples think that the best time for an engagement shooting is in the middle of the day. Unfortunately, no. Sunrise or sunset is the best time for a photo session. During the sunrise the city is not crowded and it's possible to take photos on the most famous and iconic places. During the day and in the evening these locations will be full of tourists. If you are dreaming about professional pictures at St Mark's Square, choose sunrise time. Sunset is perfect time to discover authentic places with your engagement Venice photographer. If you prefer water channels, romantic bridges, cozy streets, then let's meet close to the sunset. A lot of couples want to hire engagement Venice photographer during a gondola ride. Gondolas start working at 9:30 am and finish at late night. If you book a sunrise shoot (for example, at 6:30 am) for 2 hours, we can't do the gondola ride. So, late afternoon is better if you want to add the gondola. If you book a package for 4,6 or 8 hours we will divide the time for the sunrise and sunset, to have best light. What is the best period for a photo shoot in Venice? All seasons are good in Venice but personally I would recommend you spring or autumn period. April, May, September and October are best months. The weather is warm and there are not so many touristic groups like in summer. In winter it's possible fog. It creates a very romantic and soft background. If you are going to get married in summer season it makes sense to choose winter season to make a photo shoot in Venice. You will have pictures in two different seasons. Send me request for more information.